New lands have opened up and the rush is on to create rail and road lines between the different cities that border this region. Planners have been brought in to submit their ideas. But in the end, only one will get the contract. Players will have to make careful decisions and plan their maps wisely if they hope to win Railroad Ink. Both the Blazing Red and Deep Blue editions offer their own unique challenges and experiences, but each game starts with the same basic idea: start with a blank slate and build a transportation empire! In Railroad Ink, the dice are rolled each round and up to six players use the results to create Routes across their maps. Players each start with a dry-erase Board and a Marker. The Board contains the main grid that players will be drawing their Routes on, with alternating entry points connecting to cities off the map. The Board also has a handy reminder of what possible results are on the Route Dice that are used during the game. Players can take advantage of Special Routes when they need to make a power move or get out of a jam. Finally, there are spaces on the Board to work out your score at the end of the game. The Route Dice are rolled at the start of each round. They determine what sorts of Routes are available to players to start building their maps. Three of the dice are identical, while the fourth shows connection spots between Routes. Players must draw all of the Routes that are shown on the dice on their Boards. Routes can only connect to pre-existing Routes (hence having the entry points along the side of the Board), and only Routes of the same type (either Road or Railroad) can connect to one-another (unless you have a special connection Route that’s shown). Players draw their Routes simultaneously. During this time, they can also choose to use a Special Route from their Board. However, each Special Route can only be used once per game. After six rounds, players tally up their scores. They earn points for the longest Rail and Road Routes they’ve created, as well as points for connecting to cities off the board via the entry points along the edge. However, dead end Routes are called Errors, and points for them are deducted from a player’s final score. There are two different editions of Railroad Ink: Deep Blue and Blazing Red. Each one contains two pair of Expansion Dice that can be added to games. For Deep Blue, it’s the River dice and the Lake dice. Blazing Red adds the Volcano dice and the Meteor dice. Players can choose to use one of these dice sets for a completely different experience. The River dice work like other sorts of Route dice, with players attempting to create the longest continuous river on their Board. The Lake dice give players the chance to create a cool and refreshing lake, scoring points for the largest single Lake they’ve drawn. The Lava dice work similar to the Lake dice, however, they can potentially destroy other Routes around them, rolling over Road and Rail Routes with ease. The Meteor dice cause molten rocks to rain down from the skies, damaging Routes that they land on. Railroad Ink requires players to think quick and plan their routes very carefully. They never know what sort of Route might come up on the dice, but by making plans that are adaptable to different situations, they can prove that they’re the best highway and rail engineer of them all. Throw in some twisting rivers or some falling meteors, and you’ve got a game that’s never quite the same twice. The dry-erase boards can be used time and time again, giving you a fresh slate each time you play. Plus, each set seats up to six players, or up to 12 if you’ve got both available, meaning everyone can join in on the fun. 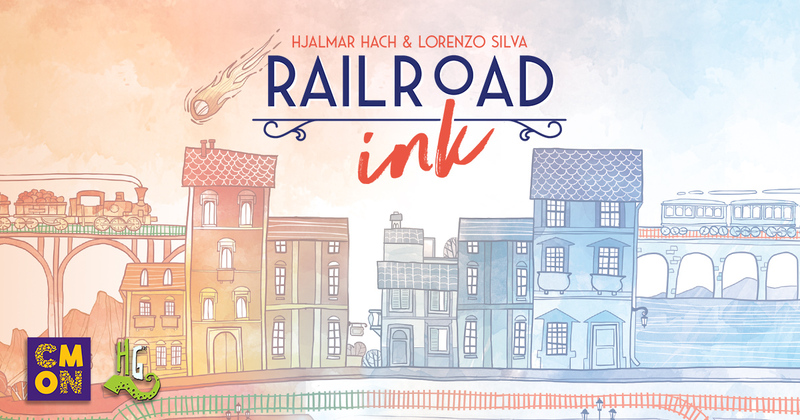 Railroad Ink will be available in your FLGS on November 30. You can read more about Railroad Ink here.